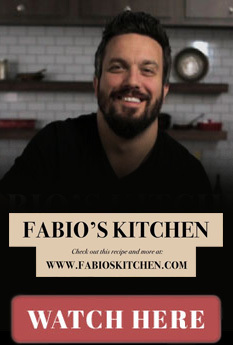 #TeamFabio: I am so excited to announce a NEW SERIES I’m doing with Cooking Panda, an online food publication that’s killing it on Facebook. Web series are really the wave of the future for cooking shows, so I was excited to get involved with a company that’s experimenting with different ways to get people excited about food using social media. I love social media and I love food, so this was a match made in HEAVEN. This series was so exciting to me because we’re making the kind of food that people really want to eat, keeping it lighthearted and demystifying the process a little bit. Often times people watch cooking shows and think “I could never make that at home.” The recipes in “Wine-ding Down” are not like that. On the contrary, my hope is that you watch an episode and can make each and every dish either with ingredients you already have in your kitchen, or after a quick trip to the grocery store. The reality is that not everyone has the time or money to go to a farmer’s market every week to pick up exotic meats and local vegetables. And while those things are great, they definitely aren’t necessary for these recipes. Good food can, and often should, be simple. Why do people think of making a meal as a chore? We have enough stress in our lives. When we come home, creating a meal should be something that relaxes us and that connects us with our family and friends. I think this goes back to my last point — we’re thinking that making something actually worth eating will cost us lots of time and lots of money. Let’s reframe how we think about this and use the process of making and eating a meal as a time to reconnect with yourself and the ones around you. There are ways to make delicious food without breaking the bank and without stressing yourself out. That’s really my goal with this series — your life is hard enough without worrying about what to cook and how difficult it is (it isn’t). 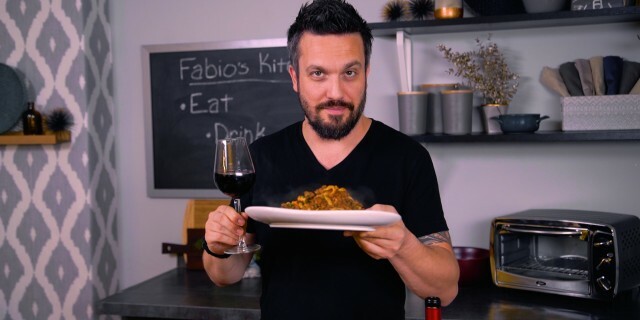 Relax, watch a “Wine-ding Down” video, and have a glass of Fabio Viviani wine. YOU DESERVE IT! We can’t take ourselves too seriously when we cook. Did you ever have an art teacher tell you “There are no mistakes in art”? Well, that’s not exactly the case with cooking; you can definitely make mistakes, but messing up and creating something that’s not totally perfect is more than alright. Who cares if you make a pizza and it’s not perfectly shaped? Call it rustic and ENJOY IT. People often try to be perfectionists in the kitchen, and they don’t need to be. The point is to have fun and make something that tastes good. So the moral of the story is that creating beautiful and hearty meals for yourself and your family should be fun, relaxing, and accessible. “Wine-ding Down” is a series that has all of these principles in both content and format — the fact that it’s on Facebook and anyone can watch it and make the recipes we’re teaching was really important to me. You don’t need a cable TV subscription to see this series; it’s for everyone to watch and enjoy. And these videos are less than a minute long, so you can wine-d down with me and still have time to make these dishes yourself! BOOM.